At this time of year when a non-booted foot is hard to find and water sports are put on hold, the thriving wine tasting scene of the Finger Lakes continues to warmly welcome out-of-town visitors and locals alike. Perfect for Sunday outings and evening forays, vineyards and wineries, dotting the lake shores, highlight the terroir of the Finger Lakes region of upstate New York. Red Newt Cellars Winery and Bistro, with its large windowed dining room overlooking the vineyards of Sawmill Creek, is a great stop along the way for lunch. Located in Hector (Schuyler County), on the eastern edge of Seneca Lake, it boasts a selection of over 20 house made wines and a tasting and lunch menu with some hints of local fare in the heart of winter. What visit to a winery for lunch would be complete without a wine tasting? I decided to journey through Red Newt’s diverse selection of fragrant Rieslings. For a reasonable $9.00, I explored the spectrum of dry to semi-dry in order to better understand the variety of acidic and sweet notes available in this Finger Lakes specialty. To complement our wine, my grandparents (who were my dining companions at this scenic lakeside spot) and I shared a tasting plate. Each element was unique and provided a glimpse to the area’s agriculture landscape. My favorite was a nice little chunk of a brie which Kenton Burr of Kenton Cheese Co. produces with milk from his family’s 6th generation dairy farm in Trumansburg (Tompkins County) [www.ilovethefingerlakes.com/basics/agriculture-cheesemakers.htm]. I spoke with Kenton on the phone and was pleased to discover that his blooming mold-ripened cheese is raw (aged at least 60 days), a rare find these days with the plethora of pasteurized brie. After our tasting, my grandparents enjoyed a corned beef sandwich with beer-braised collard greens and I had a bowl of the potato-parsnip bisque. Parsnips are a wonderful winter treat. The taste of parsnips, similar to brussels sprouts, does not reach full maturity until a hard frost has turned this root vegetable’s starches into sugars, which yields a special combination of earthy, sweet, and spicy flavors. For me, our pleasing meal at the Red Newt Bistro was contextualized within the greater culture of winter food production in the Finger Lakes. The tables at the Ithaca Farmer’s Market, a cooperative with 150 vendors in summer and a good number during the winter months (vendors live within 30 miles of Ithaca) are loaded high with roots, onions, garlic, meats, cheeses, eggs – all testaments to the preservation in winter of the summer’s sun and grass. Many farms also boasted bok choi, napa cabbage, mizuna, and lettuce. In fact, the 2012 winter issue of Edible Finger Lakes displays glamorous shots of the variety of greens available throughout the winter. Ten types of winter greens are photographed in detail and beautifully document the achievements of hard working and innovative farmers who are using unheated greenhouses to extend the growing season in this area. 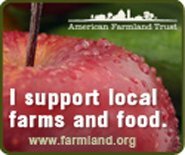 There are also numerous winter CSA (community supported agriculture) farms (Remembrance Farm, Stick and Stone, & Sweetland Farm). In the 19th century, in upstate New York it was not uncommon for a farmer to plant a field or two of oats or wheat as well as some beans for the specific purpose of drying the beans for use in wintry months ahead. Cayuga Organics (dry beans and grains) and Farmer Ground (wheat, oats, corn, etc) honor this past and work hard to provide food staples to the Ithaca and New York City markets and beyond. This little bio-region seems determined to keep high percentages of local foods on the plates of appreciative folks and is well-worth exploring even in the heart of winter.